We were greeted at the bus station in Sarajevo by the extremely eccentric and cheerful Alvina of Vagabond Hostel. On the drive to the hostel, I remember thinking to myself that there’s no way this woman is actually this nice. When we arrived at the hostel, basically in the heart of the old city of Sarajevo, the pleasantries continued. We were immediately offered tea or coffee, a shisha, information about the city, and then shown to our room. I’m not going to lie to you and tell you that as journalists we aren’t often offered special treatment. Obviously, hostels and tour operators tend to treat us really well because of the potential for us to offer some exposure. Thus, it was easy for me to be apprehensive, no matter how sincere Alvina and her sister Aida seemed to be. The next 5 nights that we spent at Vagabond Hostel, I watched how they treated the other guests, each other, and their staff. I wasn’t the least bit surprised to find they treated each and every person that walked through those doors with the same loving care and welcome as they did for us. The people at Vagabond Hostel understand that travellers staying in hostels aren’t looking for anything more than a welcoming home away from home, and that’s exactly what this is. The facilities of Hostel Vagabond are basically what you’d expect from a hostel, nothing less. You’ll get your free wifi as well as free tea and coffee. There are also cooking facilities available if you should need them. The beauty of the facilities here, however, are the fact that the staff goes an extra step to make sure you’re comfortable. There are umbrellas to borrow if it starts raining, for example. You can even order a shisha if you’re keen. To explain how far they go to make sure you’re comfortable, I overheard Alvina explaining how she thought they should offer slippers for guest so that they don’t have to walk around on the hardwood floor in their socks. The rooms are, again, what you’d expect from a hostel. They are simple yet efficient. In the private room we stayed there was a big bed, lots of plugs, and a television. There were a couple minor issues with the room, but nothing really to stress about. The first issue was that there just isn’t much space in there. The two beds are so big they take up too much of the floor space making it hard to unload luggage. I’d go for one smaller bed rather than the two. The other minor issue is coupled with the aforementioned hardwood floor. The location of the private room – just down the hall from the bathrooms and kitchen – combined with the fact that sound really carries over hardwood floor means that you can basically hear every pin drop in that room. Any discussion that happens at the front desk, can be heard as well. There’s no better location in town for a hostel. 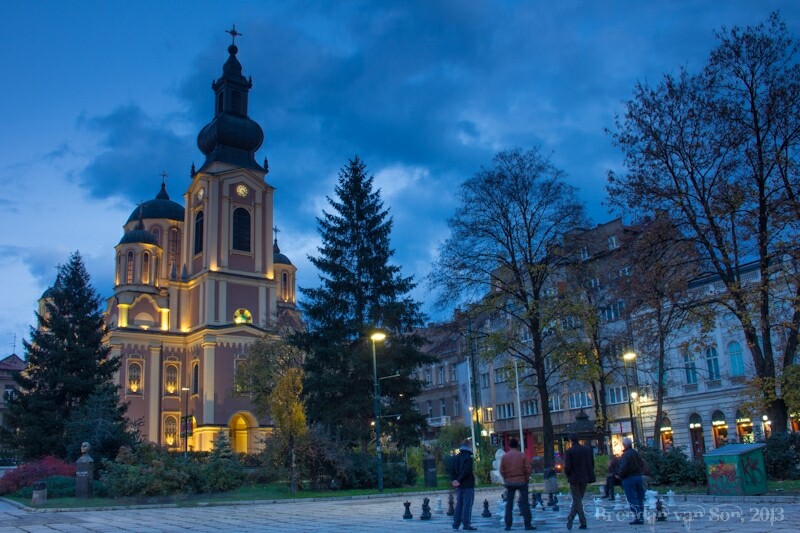 You’re directly beside the Catholic Church, you’ve also got some impressive mosques within a minute or two walk and the impressive Orthodox Church is also nearby. Moreover, you’re within 2 blocks of the major attractions such as the gallery and the bridge that Franz Ferdinand was assassinated on. There are loads of good places nearby for food, as well. As mentioned in the intro, this place will make you feel very much at home. It’s a fairly small hostel which means that it’s quiet and certainly not a party hostel. There’s a beautiful community feeling to the hostel, as well, enabled by a nice common area where guests can relax, drink a tea, chat, or watch some television. Maybe the only downside to the staff is the fact that they are too nice! On one night, a group of tourists decided to get up at 4am to start cooking a massive breakfast feast. Obviously, if I couldn’t sleep through it, no one could. I’ve slept through gunfire and grenades going off before. The staff needed to be more firm with them, rather than trying to make sure they were happy. Other than that, I can honestly say that in staying at Hostel Vagabond I didn’t only stay at a hostel, but gained a couple friends out of it as well. I know that we’ll always be welcomed by Aida and Alvina, and I’m sure they know that if I ever have a place someday, they are welcome there as well.